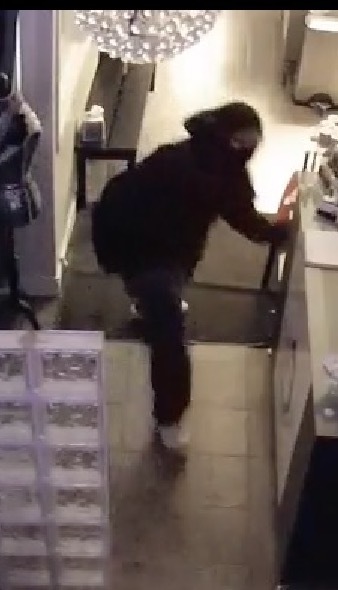 A Lakeview salon became one of the latest victims of burglars in our neighborhood this weekend — and the break-in was caught on three surveillance cameras. That’s a smart move. Burglars who target businesses have been making beelines for cash drawers and high-demand products that will be easy to sell, according to police reports reviewed by CWBChicago. In the first video, the offender is seen pedaling past Chicago Lashes, 3530 N. Ashland, and then circling back to make his crashing entrance sometime Friday night or early Saturday. Once inside, the burglar rips through the cash drawer and registration desk before checking out the rest of the salon in video #2. With the alarm beeping more urgently, the thief returns to the front desk on video #3 and leaves with the cash drawer and an iPad. “I thought with all the crime in the area this would be useful information to share with you guys and spread around to encourage security systems and being safe and cautious in the area,” Nemecek said. As we reported Friday, burglaries are up 78% this year in Lakeview and up 265% in the 44th ward.